I am 33 years old. I just found this urticaria skin rash blog from a Google search to find answers for my questions. It has been 2 days since I experienced the appearance of this skin rash or skin welts on my skin from neck down to my feet. It appears only in the afternoon and subsides in early morning. 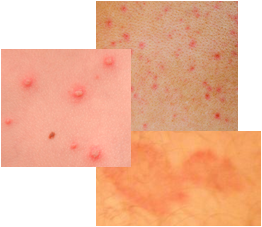 At first, a few tiny red rashes appear on my forearms, stomach, waistline, and down to my feet until they become the size of a quarter dollar or double and even triple this size over the span of an hour. Some of the hives subside and transfer to other parts of my body except for above the neck. I am having difficulty in my sleep because of the itchiness. I already take betamethasone plus dexchlorphenamine. These medications relieve the symptoms temporarily but the urticaria skin rash comes back again. I don't know if this is an effect from an allergy from the crab meat balls that I ate the day before the first appearance of these hives or skin welts. Also, last week, I received an injection of hepatitis-B vaccine in my school. Is there any possibility that I have an allergy from the said vaccine? Can the climate here in the Philippines affect or trigger the allergy? I remember when I was in my high school and college years, I was also experiencing the appearance of the urticaria skin rash but it reached all the way up to the lips. That was during the changing of seasons (rainy season to summer and summer to rainy seasons). I am always taking the antihistamine drug as the doctor has prescribed. I was tired of taking the said drug when I did not even realize the urticaria skin rash condition had vanished 100%. Only now, I realized it was gone for 13 years (1995 to 2008). Those 13 years, I was concentrated on my work as an accountant, relaxed and enjoying my eight years in Philippines and five years working outside the Philippines. Currently, I have been shipped to a nursing course since last June and that was very stressful. I do not know if there is a relationship in the appearance of this allergy from the crab meat, the weather changes, the hepatitis-B vaccine, the stressful study, or it is just a coincidence. Please help me! I will be glad to receive any medical advice from you. I am going to receive a second shot of Hepatitis B vaccine on Wednesday (August 20, 2008). Thank you. You can get a 90 day supply of the generic brand of Claritin from any Walmart for $10 (30 day supply $4) without using any health insurance, IF your doctor will write a prescription for it instead of buying it over the counter for MUCH more. I also am on the Claritin daily for this urticaria skin disorder. Hope you return to this site to read this info. I just found out about this yesterday when I visited my doctor. He took one look at my arm, which I scratched before he came in so that I could show him what I was talking about and he knew right away what it was. He informed me that there is no cure for this urticaria skin rash condition, which this site tells us. He advised me to take allergy medication. I only have one allergen and I never come in contact with it. So I was surprised when he explained to me what it is. I have been dealing with these urticaria skin rash for about a year or more and it is very frustrating. I wake up in the middle of the night and cannot stop scratching. It happens at work and people ask me what it wrong with my skin. It drives me crazy. There have been times when I could not stop scratching and thought that I was going to scratch so much that I caused myself to bleed. I have not yet, but I know if it does not stop, I will get to that point. My doctor gave me a list of things to try. Today I tried Claritin and I was not itching. I scratched my arm to see what would happen and it still turned red but it did not continue to itch. It was great. I have also started using more lotion. It helps a little but not very much. I am hoping that Claritin continues to work on the urticaria skin rash. However, it is not cheap. Oh well, I am glad to at least get a good nights sleep. I hope that you can find something that works for you, because this is not fun to live with. Take Care.